It’s no secret that the impact of emotional violence is less visible to the naked eye when compared to a bruise or a scar. The insidious, gradual and devastating buildup of emotional abuse can harm patients just as much as a kick or punch, and the worst part is that it’s often up to victims to open up and seek help. This places a lot of burden on victims, and it can be years before they are able to come to terms with their abuse by recognizing the signs, seeking help and starting a recovery process. Kimberly Hershenson, a therapist and licensed master social worker from New York City, has had a private practice for over a decade and has extensive experience working with victims of emotional abuse. She says some of the telltale signs of emotional abuse often appear in the bedroom if it’s with a romantic partner. How do you know if it’s abuse? Dr. Jeanette Raymond is a Los Angeles-based psychologist who also identifies control as a key indicator of emotional abuse, but also mentions that victims themselves can contribute to the situation inadvertently by clinging to hope that a partner will change over time if he or she (the victim) behaves better or more patiently. Affording the abuser more time will only make the situation worse and the recovery process more difficult. Raymond also mentions that abuse victims have a tendency to protect their partners when others comment about their potentially abusive behavior and can also gradually stop engaging in activities they previously found pleasurable for fear of irritating an abusive partner. Given the possible web of abuse and covering it up by the perpetrator and victim, sometimes it can be difficult to pinpoint the root cause of the behavior. Dr. Kelsey Latimer, assistant director for East Coast outpatient programs at the Center for Discovery, says she relies on the Duluth model, which talks about unhealthy relationships in the context of a wheel, when working with emotional abuse victims. Latimer then moves onto the two spokes of the wheel, isolation and minimizing, that she finds important when educating patients about emotional abuse. The isolation can be physical — by removing the person from friends and family — or, more commonly, emotional, which is more difficult to see, she notes. Emotional isolation can be visible when a person seems to be lacking presence — when they are not connecting with others in the same way they previous did and they are not letting others into the struggles in their lives. Once an emotional abuse victim has been able to identify some of these signs, there are a number of next steps. Shadeen Francis, a marriage and family therapist urges victims to connect with loved ones and surround themselves with supporters, as emotional abuse is more likely to occur when victims are isolated. In cases where breaking off from an abuser might be more challenging, such as in the case of a parent, Francis suggests having a conversation in which victims are “clear and specific about what they do not like and how they would like them to change.” She also says that abusers may not be invested in respecting boundaries, so victims should be prepared for their defensiveness and anger. 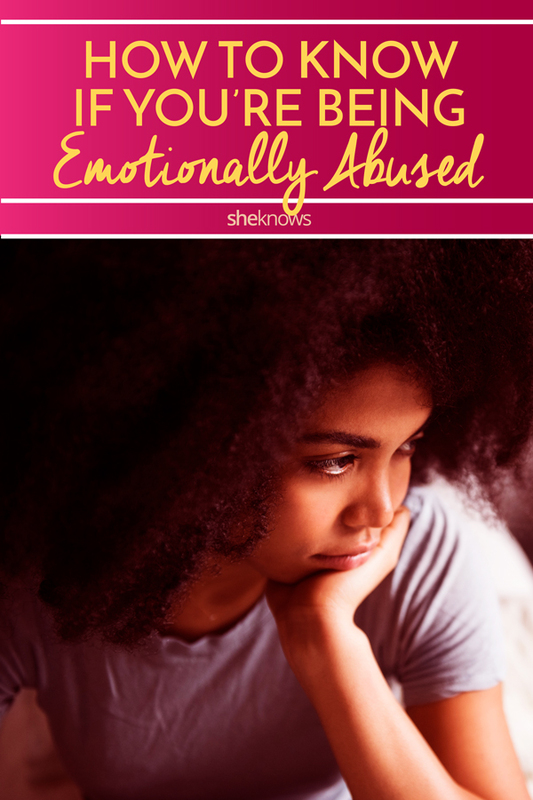 Ultimately, knowing what to look out for can give emotional abuse victims the opportunity to push back against their abusers early on and potentially protect themselves from situations that are harmful to their mental and physical well-being.